Several years ago, my Emory University hosted former Black Panther Elaine Brown for a couple of days of lecture, discussion, conversation, and meals. I attended one event and don’t remember what Brown said, but caught firmly the demeanor and cadence of the delivery. It was hip, knowing, coy, and canny, not an argument or a thesis, but clipped observations and half-articulated notions about racial and gender identity. The audience, on the other hand, was dutiful and attentive and admiring, and the question and answer session provided none of the customary quibbling and speechifying. 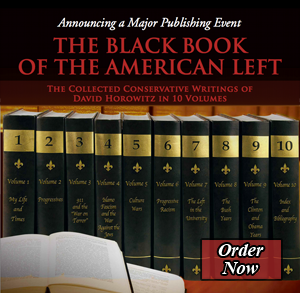 I didn’t understand this odd deference until I read The Black Book of the American Left, the new two-volume collection of David Horowitz’s writings. Horowitz had known Brown in the 1970s when she was a lieutenant of the Black Panthers’ Huey Newton. In The Black Book, he describes a menacing and erratic woman who had two personalities: one for “the Party’s wealthy liberal supporters” and another for “the violent world of the street gang.” Brown had even charmed Horowitz for a time, until he came across evidence that Brown had conspired to murder a woman he’d brought into a Panthers-run school. I don’t think that the people in the room at Emory that afternoon knew about Elaine Brown’s role in the Panthers. By then she had developed programs to help underprivileged children and stood popularly as a dedicated enemy of racism, sexism, and poverty. But one could sense more than simple admiration in the audience, a subtle excitement over a former-Black Panther in the room. It wasn’t quite “radical chic,” because none of the attendees earned any social standing from the support, more a specimen of academic chic, a chance to make contact with genuine radicalism, even if it had ended years earlier. Here was someone with first-hand experience of ideologically-motivated violent protest, and it heightened the excitement of the event. Horowitz’ memoirs demonstrate where that frisson originated and helps explain current examples of political malfeasance on campus. Many of the outrageous acts of left-wing activists today have no effect except to degrade academic standards. However, these actions allow leftist students and professors to feel connected to the old days of SDS, the Free Speech Movement, and the Chicago Seven. To be sure, the extremes of the New Left aren’t common in academia, but they carry over as lingering resentment, feats of intimidation, and coercive versions of political correctness. To understand them, it isn’t enough to examine local conditions; observers need to go back to the Sixties and Seventies. Horowitz’s book allows us to do just that.